As you can see, my artistic skills aren't the greatest (they weren't then, either), but then, they don't have to be for something like this. You draw a couple lines coming from a point, then two or three lines from the end of each of those lines, then two or three lines from the end of each of those lines, and so on, and eventually you wind up with a "plant" of sorts. and, naturally, I had to have one. So I bought it and took it back to the dorm, where it lived for a semester or so, after which point I seem to have lost track of it. I think I gave it to someone to take care of for the summer, and he killed it, or I forgot about getting it back, or we had a falling-out, or something. It was a while ago. 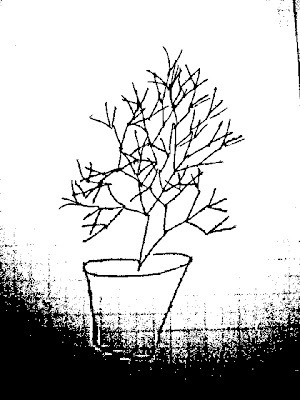 For both of those reasons, the doodling and the period in college when I owned one, this plant has a nostalgic quality to me, which I find endearing. I had to wait a long time (like, ten years or so) before I was able to find another, though: they're not especially popular. The only real requirements here have to do with light and water: light needs to be bright indirect light at minimum. Some sites advise against full sun for this species, but I think it's probably still a good idea for indoor growers: my plant has been in a pretty bright west window for months and it still looks like it's reaching for more light. Maybe that's normal, but I suspect it's trying to tell me something. Although Hatiora salicornioides2 is in the cactus family, its watering schedule should be more like that of a regular houseplant: it's not good to keep them constantly dry, but watering when about halfway dry (or even a little wetter) will work just fine during the summer; in late fall / early winter, they should be allowed to dry out more between waterings. They're not easy to overwater during the period of active growth: if you can keep a Philodendron hederaceum (and most people can), you can keep one of these. A well-draining soil mix is helpful but not necessarily mandatory, because the plant will give you plenty of feedback: overwatering causes pieces of stem to yellow and fall off; underwatering causes the whole plant to shrivel up.3 These are epiphytes in nature (rainforest epiphytes, actually, which is why they're okay with being kept wet), so they don't need or want a dense, soggy, peaty soil, but bagged mix cut with some perlite and/or coarse sand has worked fine for me. I have never had any pest problems with my own plants, but I've read stuff on line which suggests that mealybugs can be a problem for this species. Since mealybugs can be a problem for any species (keep watching: there's a post about mealybugs in the pipeline here: I'm thinking Saturday), I'm inclined to believe this, but even still, that's not a reason not to get one so much as it's a reason to check it over carefully when you buy. It's a fast grower in general, though there's a bit of a winter slowdown (more of a late-fall full stop, actually, from what I've seen), and propagation is very simple: I have probably doubled the overall mass of my plant since I bought it. Some of the cuttings were sent out on trades through Garden Web, some came with me to work to be sold there, some have made new plants here at home. Propagation can be done at any time of year, but it seems to work the best in summer: I cut a piece off (it seems not to matter whether the cut is in the middle of a segment or at the end), let it dry overnight (not necessarily mandatory, though I recommend it), and then stick it in soil and wait. I have yet to see any of them actually fail, though a few of them at work have shriveled from being too wet for too long, or from getting pulled loose from the soil. I tried rooting in perlite once, which didn't work for me so well, though some of the problem there was that I didn't keep the moisture level up in the perlite. The cuttings from the perlite transferred to soil without incident and took off shortly thereafter. As it's a cactus, it has the ability to grow thorns, though it's inconsistent about doing so and any thorns it does grow are hardly dangerous. A few segments here and there will grow lots of white, thin spines about the width and stiffness of a hair; most of the plant will be smooth. I'll grant that this is not really what you'd call a beautiful plant. Stems grow until they bend under their own weight, which can look nice in a hanging basket, if that's your thing, but mostly it's about the oddity of the form and the weird, bottle-shaped stem segments, and all that. Not everybody would find that appealing, and maybe it's just that Hatiora salicornioides and I go back a long time that makes me like them. But I think they've been undeservedly ignored for far too long. 1 Probably worth pausing here to note that, however toxic H. salicornioides might be, it's got to be a lot less so than the similar-looking but much larger Euphorbia tirucalli. 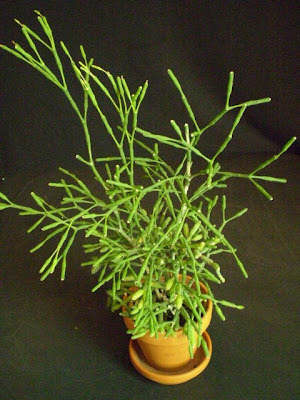 2 It is also known by Rhipsalis salicornioides, Hariota stricta, Hariota villigera, Rhipsalis villigera, Rhipsalis stricta, Rhipsalis bambusoides, Hariota bambusoides, Hatiora bambusoides, Rhipsalis teres, Cactus salicornioides, Cactus lyratus, and Hariota salicornioides. Plus I probably missed some. Clearly some sort of horrible taxonomic turf war is underway, or just ended, or something. It's possible that some of these are still valid names for some other plant. 3 The exception to this is with newly rooted cuttings, which will sometimes shrivel if they're too wet. 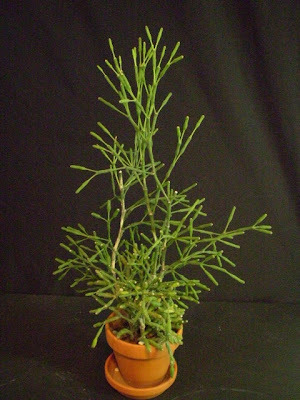 The root system is very small for the size of the plant and is easily overwhelmed. I thought your doodle looked a lot like the abused ficus tree in the previous post! I used to doodle too. My favorite was a viney thing, basically a long squiggly line with heart shaped leaves, much like a philodendron. It had the advantage that the vine could continue down and around the paper indefinitely until the class got interesting again! "I'll grant that this is not really what you'd call a beautiful plant." It has pretty yellow flowers about this time of year. The nice scent makes up for it not being the most attractive plant, I think. I hadn't seen anything about the flowers being scented. That might be worth experiencing: I enjoy trying to describe smells. Thank you for this post! We've had one of these in my family for a few decades -- but its species was always a mystery, and we knew it only as the "Brianna plant," likely for a friend of the family. A cutting accompanied me to college, where I promptly lost or killed it as well. A second cutting came with me to Colorado, where it has thrived, and I've been searching for the plant's name ever since. Thanks to your wonderful (and high Goggle-rank) photos, the mystery is finally solved :) Thanks again. I received a cutting of this plant froma nice lady at Dave's Garden where I am a mamber. This was about a year ago, maybe more. It has doubled in size. It seems not to like being overly wet, but if put in a pot with a drain, will be fine. I have never repotted it, and it does not appear to be root bound. Mine has gotten so large that it is drooping over. This plant growns MUCH faster in the Summer than in Winter. Very nice, low maintenance plant. I have had this plant since 6 months now, obtained as a cutting, its quite a rapid grower. No flowers yet. Would you please share pictures of the flowers?